At her home in Teleskof, Iraq, Areen* has a table piled high with her sewing creations. Purses, baby booties, blankets and shawls light up the room with different colors and patterns. For years, Areen ran a business out of her home, selling her products to stores locally and in Mosul. Things changed dramatically for Areen and her family when ISIS came to Teleskof. Her family was forced to flee, living in displacement for three years. When they returned in the fall of 2017, Areen found her home badly damaged and empty of possessions. Two bombs had struck her house, and everything that was not destroyed was stolen. Clothes, furniture, appliances—even the electrical wiring was gone. As a home-based business owner, Areen had lost her business in the destruction. With funding from the USAID Office of Foreign Disaster Assistance, Catholic Relief Services and its partner Caritas Iraq offered cash grants to returnees to restart the businesses they held before displacement. 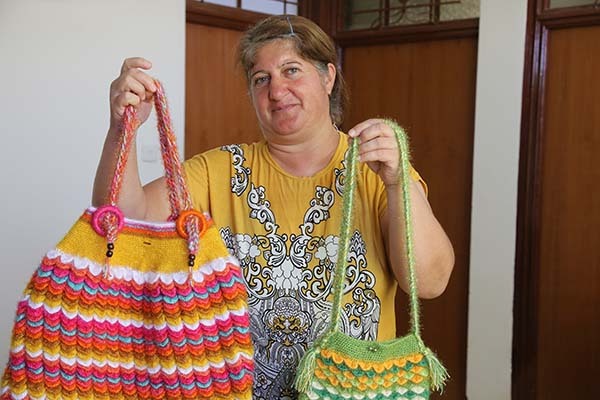 Areen used her grant money to buy wool, beads, crochet needles and other accessories. She’s already sold some of her new products and continues to take orders from stores and individuals. She has reconnected with some previous customers and suppliers, and has begun developing a new business network. Areen uses a Facebook page to advertise her work, proudly posting each new product and strategizing about how to keep attracting new customers to her products and services. It has not been easy to return and rebuild, but Areen is happy to be home again with her husband.